One year of the European Pillar of Social Rights: window dressing or a meaningful way to make Europe truly social? 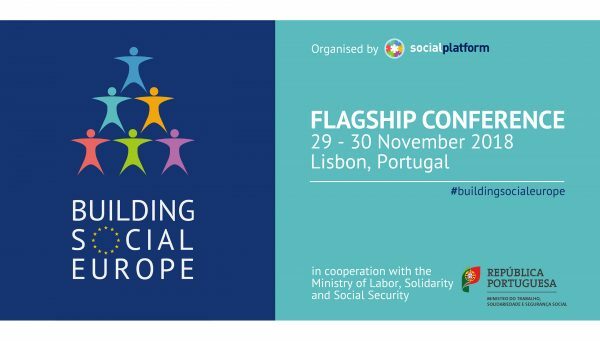 Over 150 European civil society representatives, European, national and local officials and academics from 12 EU countries gather in Lisbon on 29-30 November for a Flagship Conference “Building Social Europe” organised by Social Platform in cooperation with the Ministry of Labour, Solidarity and Social Security of Portugal to mark the first anniversary of the European Pillar of Social Rights to take stock, to debate and to discuss how to turn the tide towards a truly Social Europe. During the conference we will discuss how the political commitment made during the proclamation of the Social Pillar can be translated into effective and meaningful implementation. We will also debate how to ensure that the decision making process on social issues fully involve civil society organisations. We believe that a truly strong, sustainable, socially and economically just Europe is only possible when people and their well-being are the core of the debate and civil society are fully involved. This conference takes place at a critical time, a few months before the European elections and the institutional transitions in 2019. If we want the commitments made at last year’s Social Summit in Gothenburg to be carried forward, we need to show how it will benefit people’s lives. The European Union has an important role not only to help create more and better quality jobs, but also to strengthen effective social safety nets so everybody can live in dignity and realise their full potential.